Relevant magazine cited a Gallup poll that revealed America’s trust in the clergy has hit a record low. And it’s fallen steadily since 2002. In the early 80s two thirds of people respected spiritual leaders. Now only a bit more than one third (37 percent) do. Though the clergy appears above the midpoint on the list, they’re still far from the top. Nurses hold the top spot at 84 percent, with the bottom slot going to members of Congress at 8 percent. I mourn this decline in the standing of our clergy. If there’s anyone we should be able to trust, it’s our spiritual leaders. Yet trust must be earned. And once it’s earned, it must be maintained. As a group, today’s clergy isn’t doing enough to maintain trust. I won’t name names or mention specific organizations. I’m sure you can quickly make a list. It saddens me that most everyone can site a religious leader who has let them down through their moral failings or ethical lapses. Although the clergy are human and subject to temptation just like everyone, they must rise above their human failings. Because of their influence, they will be held to a higher standard (James 3:1). Yet they don’t always do this. And when they falter, everyone knows it. Their sins are (eventually) broadcast for all to see (Luke 8:17). However, we shouldn’t judge Jesus by the shortcomings of our religious leaders. We shouldn’t turn our back on God and reject him, just because some of his representatives failed us and disappointed us. 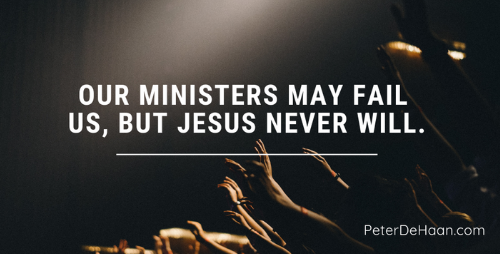 Our spiritual leaders may falter and let us down, but we must remember that Jesus never will, and Father God never will either (Deuteronomy 31:6).